Put-in-Bay Ohio is a great destination for your next school field trip, conference or corporate retreat. With the numerous attractions of historical and educational interests, Put in Bay offers something for everyone. Put-in-Bay is an excellent learning experience for school groups of all ages. Corporate groups enjoy a relaxed atmosphere where meetings are productive and focused. Put-in-Bay offers numerous activities that make an ordinary conference enjoyable and memorable. PutinBay.com staff can assist you in your planning to include your itinerary, golf cart, bicycle, or transportation needs, food and beverage and lodging if your plans include an overnight stay. For help or information in planning your next retreat, simply e-mail us and one of our representatives will contact you to assist in making your next event special. Be sure to plan early, as spring, summer and fall is the island's busy season. Delaware Golf Carts and Bicycles offers discounts to tour, school and corporate groups visiting South Bass Island with prior reservations. All carts are street legal and feature tops, windshields, headlights, turn signals and seat belts. Golf carts are the primary method of transportation on the Island. Delaware Golf Carts rents by the hour, day, or week. Overnight rentals are available. All golf carts from Delaware Rentals are gas models. Gas powered carts are faster, run for days on a tank of gas, and do not get slower as the day goes on as electric golf carts do. Whether this is your first visit to Put-in-Bay, or you have been here many times, Island Club Taxis is available to answer all your questions and provide your transportation. We want your visit to be a pleasurable experience. Please feel free to contact us by EMAILING US or PHONE at 216-898-9951 with any questions you may have about our taxi service and the island. We are available seven days a week, year-round, to assist you with all your transportation needs while visiting Put-in-Bay. 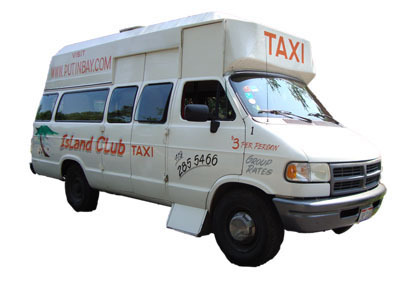 Island Club Taxis specializes in weddings, conventions, groups, school groups, business meetings, family reunions, and tours. We offer DISCOUNTED RATES to groups! Island Club Taxis and our other island business partners can assist you with wedding and reception location and arrangements, lodging, business meetings, catering, fishing charters, and camping. Let us do the planning for you and make your event worry free! To make arrangements for your group or just to ask questions about our special group services, contact us by EMAILING US or PHONE at 216-898-9951.